Busy, busy, busy. That is probably the best description of the second day of this year’s LASER. It was an excellent mood among the people and there was steady traffic on all booths. It seems as if particularly small companies are benefiting from the recovery after the last crisis: larger companies had to shrink their staff and now they are outsourcing many tasks while slowly recruiting new people. 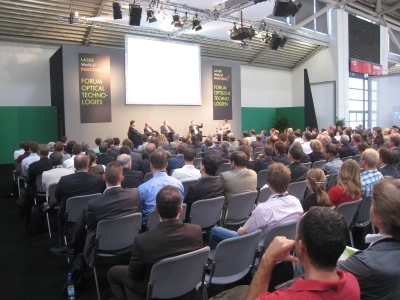 It is certainly impossible to visit all the events at the trade show and it looks even more difficult to follow up with the various conferences. Restricting myself to the bigger events, I visited the CEO Round table talk. The speakers in this round (there was actually no table at all but worse, not enough microphones) were David Marks, Qioptic, Stuart Schoenemann, CVI Melles Griot, Ulrich Simon, Carl Zeiss MicroImaging, John R. Ambroseo, Coherent. The headline was rather ambitious: “The response by optical technologies to social mega-trends – energy, health, infrastructure and security”. In contrast to that, the first topic discussed was the recent crisis. John Ambroseo from Coherent remarked that the new thing was the strong impact of global economic trends. 10-15 years earlier, the laser business was more disconnected to such trends. Now the economic crisis affected sales over night. The cut of 40-50% was dramatic. Still, many companies invested in R&D and harvest the results now in he upturn. Summarizing he said, most companies did a tremendous job in the downturn and in the upturn as well. Getting back to the big mega-trends, they came to the point, that photonics is certainly not creating mega-trends, but the photonics industry responds to those with products desinged to push the trends further. Within the Q&A session, there was at least one interesting point: What can we learn from Apples incredible success (I was typing my notes on an iPad…)? Well, they combine simplicity with outstanding execution of function. And that is what we can learn. The day went on with many conversations, and in the afternoon the preparation for the evening highlights became apparent: Within recent years, Tuesday became the day for the big booth parties. If there is a tradition, than toptica has certainly earned the fame for the biggest (more or less public) booth party. Only the biggest one can compete with that, I guess that the TRUMPF party (not public) was not smaller. Unfortunately, I had an appointment outside the fair grounds and could not attend neither of the parties. Nevertheless, I had a drink in the afternoon. Which is quite exceptional for a German. It was on the optic.org booth, where they offered a selection of excellent single malt whisky and whiskey. The Irish one deserves that linguistic accent, it was most popular.